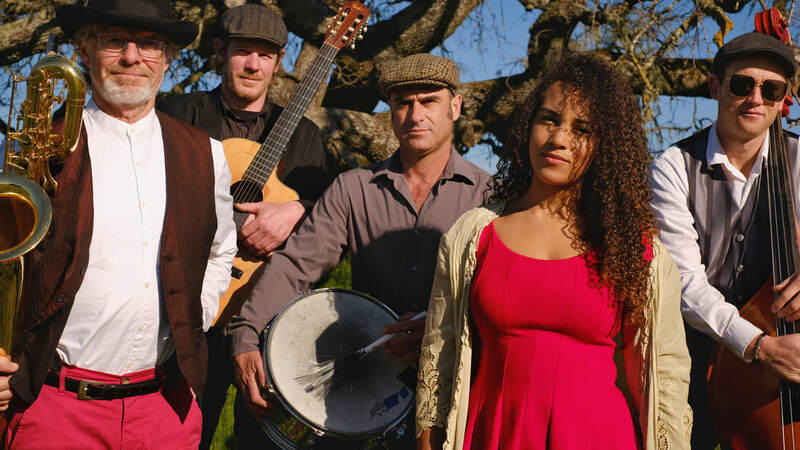 French Oak Gypsy Band is a wild-around-the-edges experience, melding Manouche Jazz & French Chanson, New Orleans Jazz & Dixieland Swing, Roma Traditionals & Global Folk. North Bay native Stella Heath, with her magnetic vocals, leads this band of gypsies in their irrepressibly fun performances. Also featuring the tight rhythms and well-loved artistry of: French/American guitarist Gabriel Pirard, James Inciardi—tenor, baritone and soprano sax, Skyler Stover—standup bass, and Jamie Foster—drums and percussion, French Oak famously inspires dance! With their global panoply of sounds, you will embark on a caravan ride: a song journey through many lands!